dee's steel forms and accessories are used to construct critical support infrastructure for domestic and overseas facilities, established bases and conflict areas/war zones. Following are several examples of US military installations around the globe including a flight line, a parking pad, custom form sets, an airfield, a vehicle maintenance building foundation, and infrastructure work. Staff Sgt. 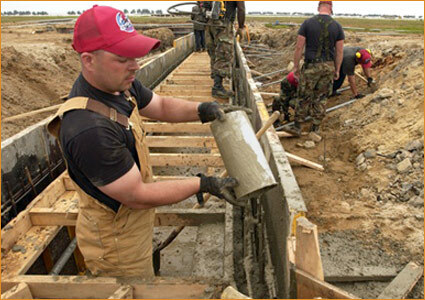 Shawn Vanzandt pours cement at the barrier systerm on the flightline at Kunsan Air Base, South Korea. 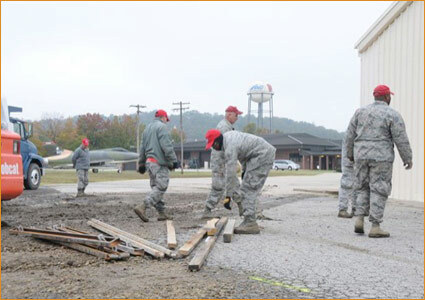 The 567th Rapid Engineers Deployable Heavy Operations Repair Squadron Engneers (RED HORSE) Squadron (RHS) replaced a gravel parking area with a concrete parking lot at Ebbing Air National Guard Base, Fort Smith, AK. Steel and wood forms like these are typically secured using dee's cold roll nail stakes. Customized form sets were needed for major reconstruction work at the US Naval Base in Guam. Many different form lengths with custom dowel patterns needed to match forms on the opposing side of the form layout. dee welded sequential metal numbers onto every form end to prevent error in the assembly process. When the U.S. Military needed to expand their runways to support ongoing operations, dee suppled forms and accessories. Along with the new runways, helicopter landing pads were constructed as well as other base infrastructure work. 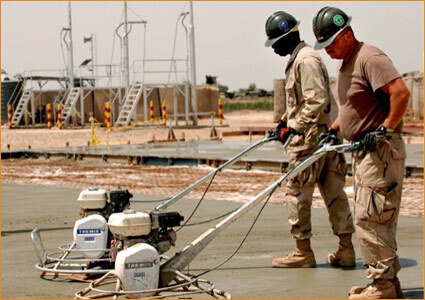 US Navy 070423-N-6436W-024 Seabees from Naval Mobile Construction Batallion (NMCB) 4 and NMCB-28 work together to finish a concrete foundation using steel paving forms for a new vehicle maintenance building in Balad, Iraq.